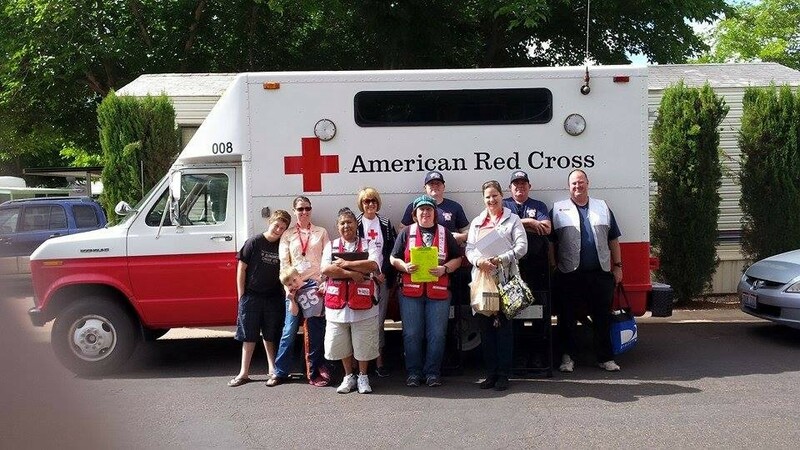 WASHINGTON CITY – Going door-to-door to the homes in the King’s Row Estates community Saturday morning, two teams of volunteers clad in American Red Cross vests offered free smoke alarm serving and installation. Some residents passed on the offer, while others welcomed the volunteers and allowed them to check their existing smoke alarms and install new ones, or set appointments for the volunteers to do so. “At the end of the day, (the smoke alarms) don’t cost the homeowner anything,” said Paul Dunsdon, disaster program manager for the American Red Cross’ Central and Southern Utah chapter. The volunteers are out as a part of the American Red Cross’ national Home Fire Preparedness Campaign. The campaign’s goal is to reduce home fire fatalities by 25 percent by not only offering residents new, 10-year smoke alarms, but also providing a little fire and safety education at the same time. According to the Red Cross, the vast majority of Americans don’t have a fire evacuation plan and many don’t have smoke alarms in their homes. As people can have as little as two minutes to escape a home once a fire starts, having a working smoke alarm that provides a timely alert can can save lives. 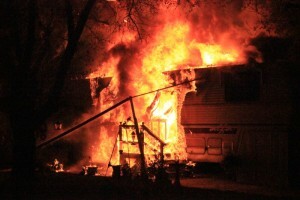 Having a working smoke alarm can cut the risk of dying in a house fire by 50 percent, according to the Red Cross. The smoke alarms provided through the Red Cross’ fire preparedness campaign come through donations. The Washington City Fire Department donated the ones offered by the volunteers canvassing neighborhoods, Dunsdon said. The communities where the Red Cross sends its volunteers are ones considered to be at higher risks for fires than others. King’s Row Estates was identified as one of those communities due to its being filled with modular homes, which, due to their lightweight construction, can burn rapidly once a fire starts. “And so we know that with modular homes and these types of developments, they can be a little more at risk,” Dunsdon said. In April, King’s Row Estates was the site of a fire that destroyed a trailer home. While some of the homeowner’s belongings were able to be salvaged, two pet dogs caught in the trailer did not survive the incident. Many people in the modular home community knew the woman who lost her home, so the Red Cross’ campaign strikes a chord with them, Dunsdon said. 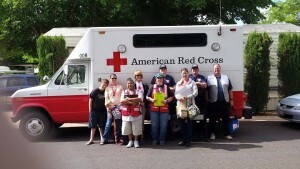 Around 10 people, Red Cross staff and volunteers, canvassed the area and installed approximately 10 smoke alarms. Some appointments were also made to return for installations later on, such as the home of Sybil Hemmert. While Red Cross staff were on hand, a lot of the footwork was done by the volunteers. The volunteers are given a 45-minute orientation and then set loose in the community for around 90 minutes. Saturday’s volunteers came from diverse backgrounds. Among them was a nurse, a member of the Shivwits Band of Paiute Indians, a pair from The Church of Jesus Christ of Latter-day Saints Charities, and an Air Force veteran. Christopher Lister, who served as a munition systems specialist in the Air Force, said his time in the military helped him understand how safety, security and disaster preparedness are all interconnected. Now he volunteers with the Red Cross, which helps address those interconnected issues. Additional canvassing will happen in other parts of Washington City, Dunsdon said. The overall goal is to get 100 smoke alarms installed throughout the city. Statewide, the Red Cross hopes to see 1,000 smoke alarms installed between July 2015 and July 2016. 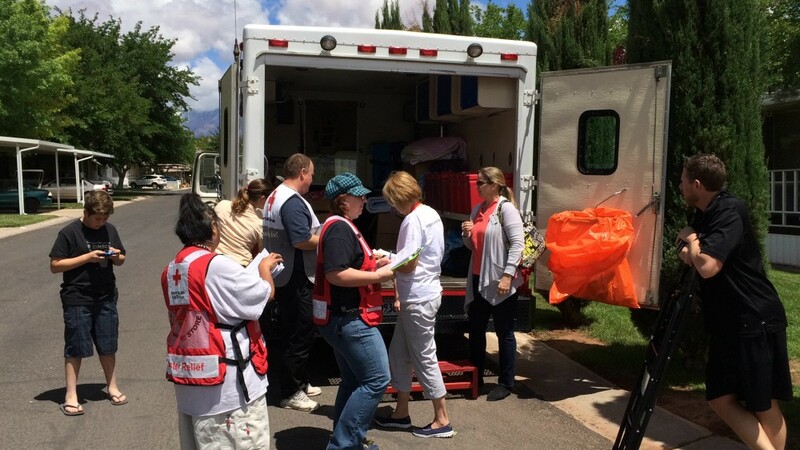 Once done in Washington City, the Southern Utah chapter of the Red Cross will go to neighboring cities and work with their fire departments to identify potential communities for canvassing. Individuals who would like to contact the Red Cross’ Southern Utah chapter for volunteer opportunities, or to schedule to have their smoke alarms serviced or replaced, can call telephone 435-674-4440. Volunteer information can also be found on the Utah Red Cross’ website.